Nobody lived there. The place was inhabited by all kinds of domestic animals: ducks, chicken, cats, turkeys, rabbits, sheep, donkey, two horses, and even two peacocks. Once a day in the evening a care-taker would drive in to feed and pick up customary eggs of different shapes and colors. He would swing estate’s main gate wide open and have all animals freely go out for pasture. At dusk, he would whistle, and animals would return one by one. When I was preparing for an art fair in Carrousel du Louvre, Paris in November of 2018 I thought about creating support material by transferring all five images of this series into a newspaper format. There were obvious benefits like portability of medium and enhancing the experience by incorporating printed word, as well as challenges of image presentation. All these considerations were off when Sacha Baumann, a publisher of the broadsheet Full Blede, invited me to participate in The Continuant issue of the publication. It was simply a different experience altogether: it was a publication of contemporary writing and art as a tangible object of a thoughtful curation of artists’ views on specific topic. Why an object ? May be due to its almost forgotten tactile sense of turning a newspaper page and dropping it on a table or folding it in-half after last page is over. It takes a leap of faith to go from a large scale images envisioned jn my mind to physical objects of archival pigment prints placed within the gallery space. Seeing them born out of a dark room litho developer on a thin 4x5 long forgotten ortho Kodak film, transferred into a digital realm of contemporary post production, layered with deep blacks on heavy weight Hahnemuhle paper, and, finally, claim existence on their own terms in the public space of a gallery. It's a quiet moment when the installation is completed and before the crowd pours in.... For now they are alone for the night in their innocence before facing the hail of judgment. In my search of the source material, I was traveling through the sites where it would be the most probable to experience the reverse perspective not only as a mind play, but also, if possible, to see it in a real-life utilitarian context, for example as a part of an architectural composition. In other words, how does a visual plane that employs the reverse perspective is perceived in a case when it is readily available and is outside of museum environment or distant observation during a religious ceremony. Like a fresco that reflects early morning sun to shine it on those laboring up the steep steps day in and day out. An issue of the reverse perspective is debated among art historians on a question of whether it was intentional or due to the insufficient knoladge at the time. Roughly up to 15th century before Italian Renaissance laid down theoretical foundation for the linear perspective, the depiction of subject matter on two dimensional plane often was diverging away from a viewer rather than converging into a distant point as it is common now. Images of Byzantine school of iconography represent this kind of perspective (e.g. 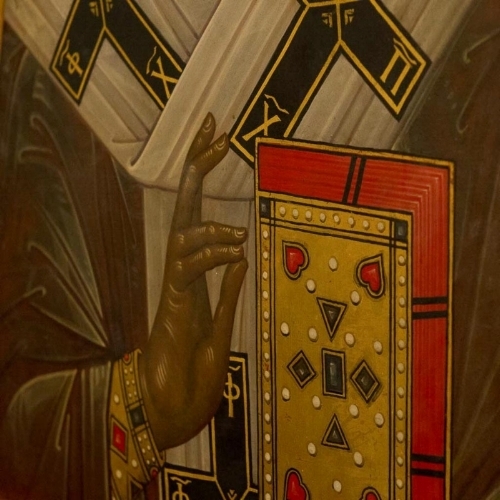 a detail from an unidentified icon on the left). In 2012, while in Moscow, I took this image as a response to a book on reverse perspective without planning or thinking about any specific project but rather reflecting on a different point of representation. Now, when I'm developing a body of work where a philosophic idea of experiencing the world by a human is centered inside of an observer rather than on an outside, I want to share my creative process in a series of postings. Leave your email address if you wish to receive updates.